This two volume set was found in the home of Fred Gretsch Jr.( 1904-1880) in Manhasset, New York. The books was given to his niece Katherine (Katie) Gretsch Cuddeback after his death in the spring of 1980. My sister Katie gave me the books after I moved to Ann Arbor, Michigan in 1995. 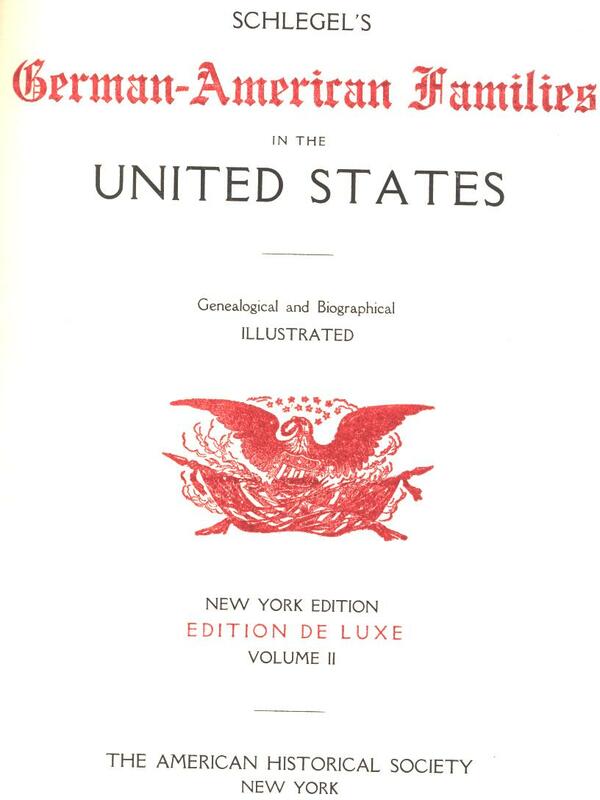 The first volume of this two volume set of Schlegel’s German-American Families in the United States was published in New York in 1916 by the American Historical Society. An elegant black and white portrait of Carl W. Schlegel follows the frontispiece of Volume I. Here is the only mention of the full name of the Editor. No author is given for any of the essays in either of the volumes. However, a careful reading of the “Gretsch” entry reveals that the writer of the essay is Emily ( Emilie) Gretsch (1854-1938). For more information on Emily Gretsch, you can read her history on the “Timeline” section of the navigation bar of this website. The frontispiece, Pictured above, introduces the second volume in the set. 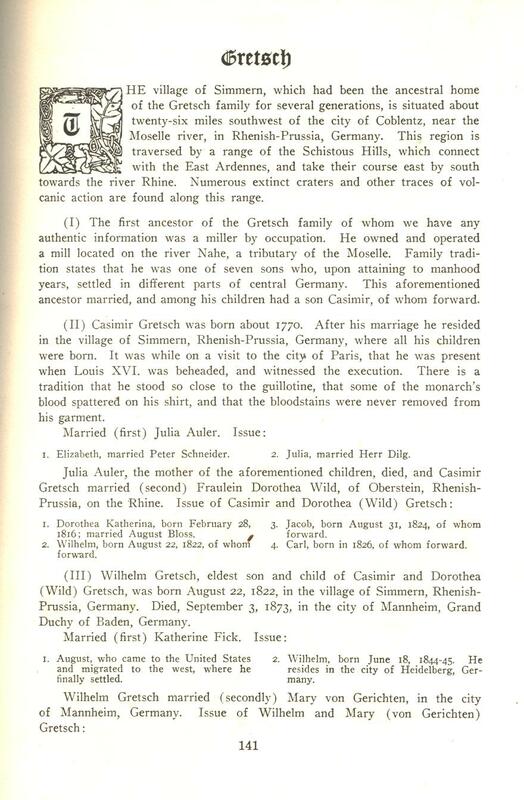 In this volume can be found an essay on the “Gretsch” family. It was published in 1917. 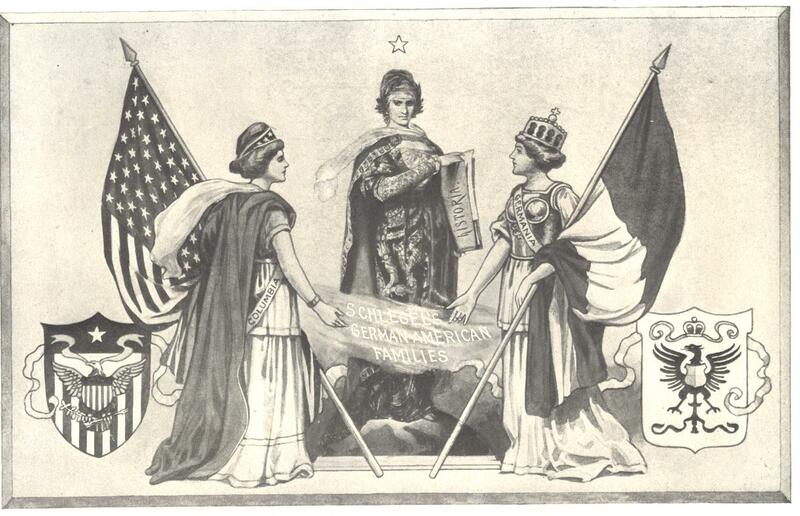 This picture of three woman, Historia who stands on an orb higher than the other women, Columbia representing America and Germania representing Germany, is found opposite the frontispiece of Volume II. Its hand drawn lines and flowing robes and flags contrast with the stark black and white portrait of Carl W. Schlegel at the beginning of Volume I. It is interesting to note that in the spring of 1904, Miss Dieter portrayed “Columbia” in a float created by The Germania Society in Joplin, Missouri. The newspaper report of this parade does not specify whether Miss Dieter was Kate Dieter or her younger sister, Hattie. Most likely it was Hattie who was much more outgoing than her older sister, Kate. To read more about the Dieter girls in Joplin at the turn of the 20th century, see the “Timeline” segment on the navigation bar of this website. 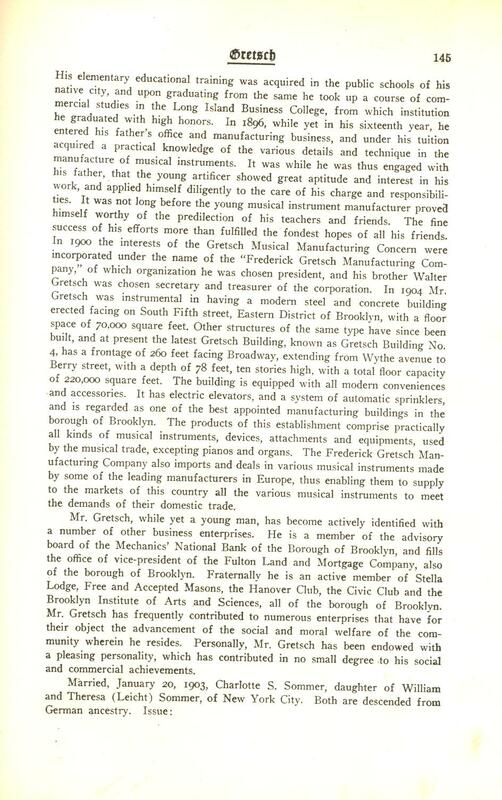 Following is a copy of the essay on the Gretsch family. 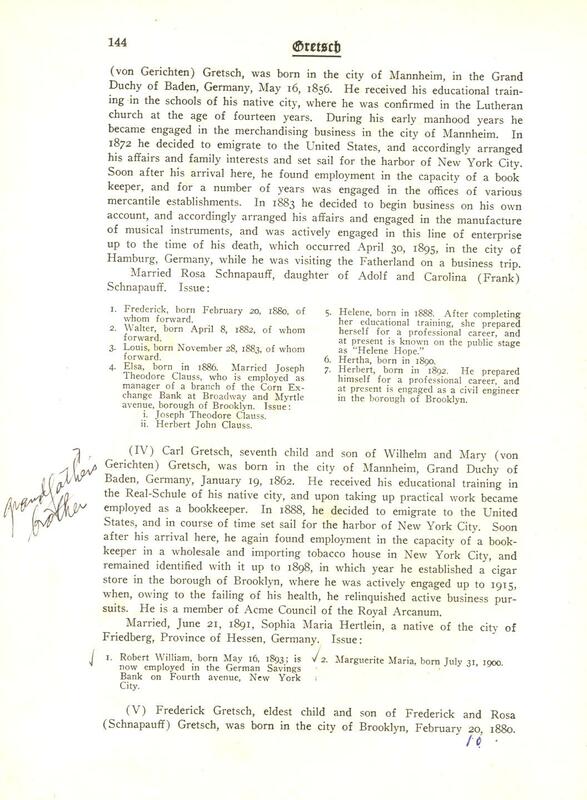 The facts which Emily ( Emilie ) Gretsch decided to includes and to leave out of her essay, “The Gretsch Family in America” are curious. 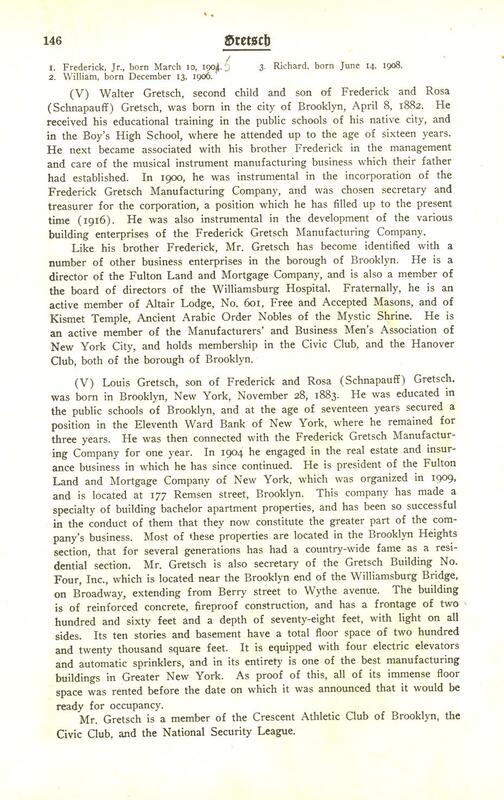 One important fact that Emily left out of the family history is the story of the very successful liquor business that William Gretsch operated in New York and Brooklyn. 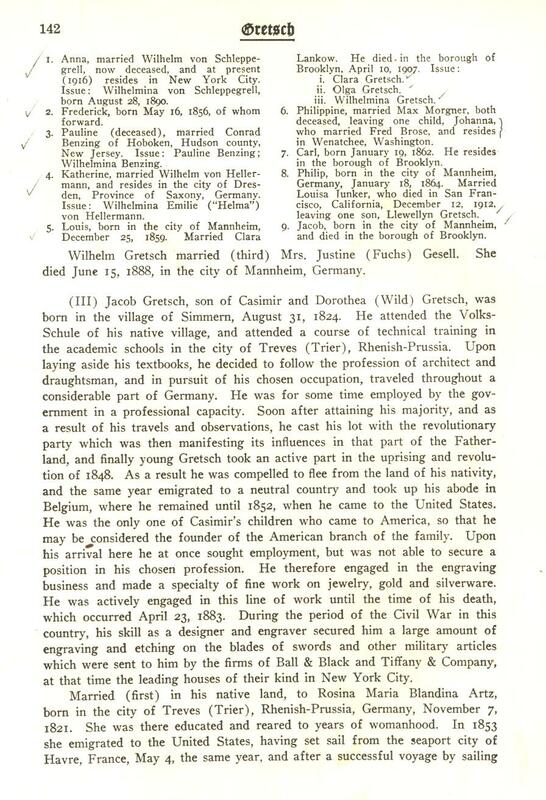 William was the oldest son of William Gretsch and his first wife, Katherina Fick. He was a first cousin to Emily. Perhaps, Emily choose to leave him out of the story because he ran a liquor business. This business did not survive as long as the music business which Fritz Gretsch began in 1883. Fritz choose not to go into the business of his older half brother. He opted to start another business entirely. Louis Gretsch, a younger brother of William and Fritz, however, followed his older half brother into the liquor business. 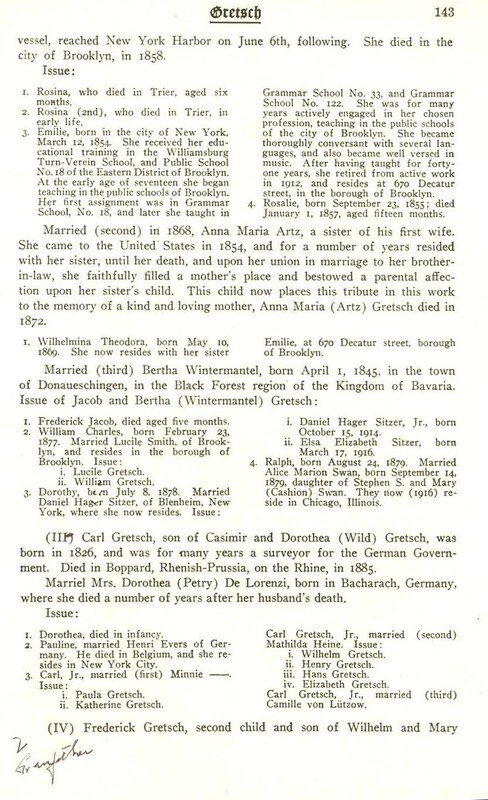 Another example of the facts that Emily left out of the family history is the story of Auguste Katherine Gretsch the third daughter and 4th child of William and Anna Maria von Gerichten . “Katie” Gretsch (born in Germany 1858, no record of her death has been found to date, 2010) came to America in the early 1880’s. Her daughter Helma von Hellerman was born in San Diego on March 24, 1884. Note the recurrence of the name Katie Gretsch. It was my sister Katie Gretsch born in NYC in 1945, who passed these precious family books on to me. Since Emily is not telling the story of the Gretsch girls in America, the adventures of Auguste Katherine Gretsch are left out. While Emily mentions the birth of Helma, she neglects to mention that Helma was born in California. Most likely Katherine had come to America to live in San Diego with her mother’s brother, Peter Karl von Gerichten. Since Auguste Katherine decided to live with her mother’s side of the family and not with the Gretsch side, Emily probably considered her not important enough to record. In this third page of the essay, a clue to the writer of the essay is given. This long complicated sentence makes it quite clear that Emilie Emily) Gretsch, daughter of Rosina Artz and Jacob Gretsch is the writer of this article.